The thing I like about work colleagues who are also friends is that they bring me candy when they travel. These are people I work with in my “other” world. Craig for example, Rachel is another, and now here I review some sweets from Julio. Anyhoo — Julio, a wonderful gentleman from Miami or thereabouts was in Europe for a much needed vacation and brought me back loads of things. Most of which I ate and liked and never told you about. These Kvikk Lunsj (Norwegian for “Quick Lunch”), however, are defined as “like Kit Kat except better.” Well thems be fighting words since I adore me some Kit Kats; regular ol’s Kits and the weird flaves they make in Asia. They are all good. So would these faux Kats with the unpronounceable name be worthy of such praise? See the date in the upper right corner? I think it says best before May 19 2012. It’s July 21 2012, two months later. So either Julio is trying to get rid of me, or he bought from a store that peddled old crap to the naive American. Either way, I still ate it. I’m sure I’ve eaten way older, and I’m still alive baby! They sure look like Kit Kat. 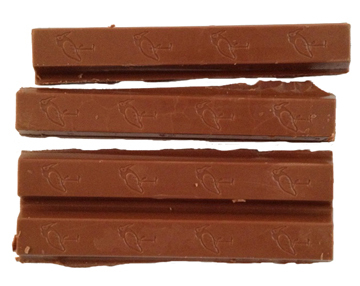 Reallllly looks like Kit Kat. But when I opened the package, the aroma is more chocolatey. 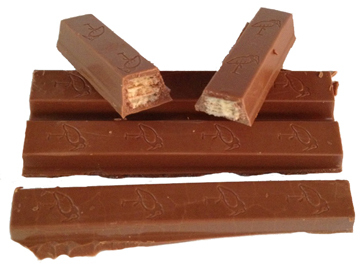 And the chocolate…uh oh….dare I say it…is better than the chocolate on Kit Kat! It’s Cadbury-esque, really more like Lindt chocolate, which although we’ve never reviewed (!) is probably my favorite commercial chocolate. Not sure if you can see it either but the chocolate is thicker too. So where I can usually pound Kit Kats by the dozen, not sure I could with these. A bit too “candy bar” and not so much “light biscuit.” But I like. I like a lot. If I could pronounce the name and ask for them somewhere I’d buy. Often. By the way, they tasted a bit old. So the best before date was right. Maybe tasted is the wrong word…they ‘felt’ a few months old. I think if they were fresher they wouldn’t have felt so heavy. But again, I’d buy more and you can too. Here, on sale now and perhaps with free shipping. Wow, now that’s a good review. You actually can learn something from it and the writer did her homework. I quit. 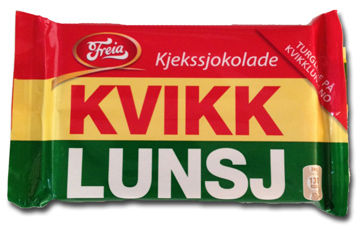 You should try “Freia Melkesjokolade”. Their pure, milk chocolate bar. Right now, it feels so good to be Norwegian 😉 Anyway, their milk chocolate is so delicious because its really high quality. We have had super strict rules here in Norway when it comes to food, and Freia chocolate (And “Nidar”, our other great chocolate and candy producer) contains very, very few ingredients and is still made with the same old molds and machine parts because changing everything, like they tried some years ago, actually changed the falvor too much! I wish norwegian candy and chocolate would gain some more recognition internationally. Super cool. Will look for it! The packaging has been the same for over 70 years, so it’s supposed to have that retro look. 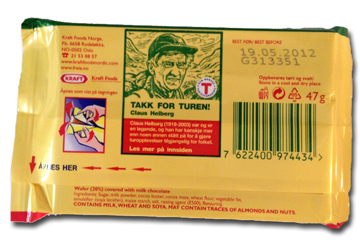 It’s the snack every Norwegian would bring on their frequent hikes, so it usually has maps of tracking trails printed inside or on the back as well.